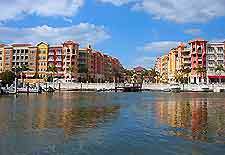 The sophisticated city of Naples is located on the southwestern side of Florida and has become an increasingly popular tourist destination. Naples is home to many wealthy residents and as a result, the facilities, shops and restaurants here are truly excellent, catering for all tastes. 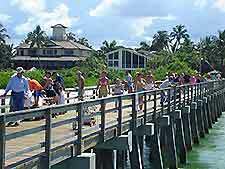 With a friendly and relaxed atmosphere, the city is known for its long, magnificent beaches, with more than 11 miles / 18 km of beaches and preserves in this part of Florida. Founded in 1886, the Naples Trolley Tour is an excellent way to find out more information about the region's rich history, operating on a daily basis and lasting around two hours. The tourism industry in Naples encourages visitors throughout the year. For current tourist information, visit the Chamber of Commerce on Fifth Avenue South. Open daily, you will find plenty of useful tourism advice here, together with local Naples bus schedules, accommodation brochures, leaflets about tourist and cultural attractions, and travel tips. Accommodation in Naples is extremely varied, ranging from expensive luxury hotel resorts to many much cheaper options. The most popular hotels are located around the beachfront and bay area, often offering superb coastal views. Further hotels can be found throughout the historic Old Naples district, around the Central Business District (CBD), in the Tin City area, and in nearby towns and cities, such as both Bonita Springs and Fort Myers. 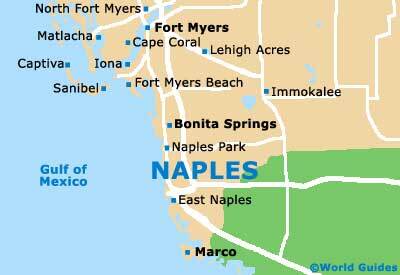 More information about Naples Hotels. Naples contains some superb tourist attractions, including Caribbean Gardens / Naples Zoo - a combined zoo and safari park, with many traditional exotic animals and rare exhibits, in large natural enclosures; Clam Pass County Park - a beach accessed via a boardwalk, with an observation tower, water sports and scenic views; the Nature Center - managed by the Conservancy of Southwest Florida and known for its vast marine aquarium; and the Everglades - with marshes and waterways full of local flora and fauna. 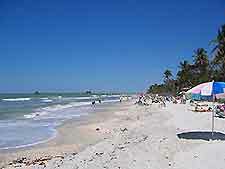 More information about Naples Tourist Attractions. Some of the city's best museums and art galleries include the Naples Museum of Art - part of the Naples Philharmonic Center for the Arts, with many separate gallery areas and a vast collection of art works; and the Lionel Train Museum - the perfect attraction for children and families, complete with a miniature steam-train railway. More information about Naples Museums art Art Galleries.